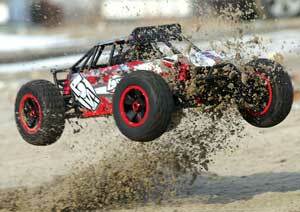 The large-scale segment of our hobby is getting bigger and Losi is doing their part to keep the momentum going. Their first entry, the 5IVE-T, hit big and hit hard and had plenty of hobbyists checking under couch cushions for lost change. Unfortunately it also hit outside of many RC budgets. Enter the Desert Buggy XL. This extra-large desert buggy is positioned to make large-scale more accessible to those of us who just couldn’t check under enough cushions to swing the $1,600 to bring home a 5IVE. Many people may have assumed this is a pared-down version of the 5IVE, when, in fact, it’s a entirely new vehicle with a totally cool desert buggy body, complete with tube frame and body panels. It is a couple of inches shorter too, but the out-of-the-box first glance promises that once you get this thing running, you won’t notice. Let’s dig in and see what the real story is. 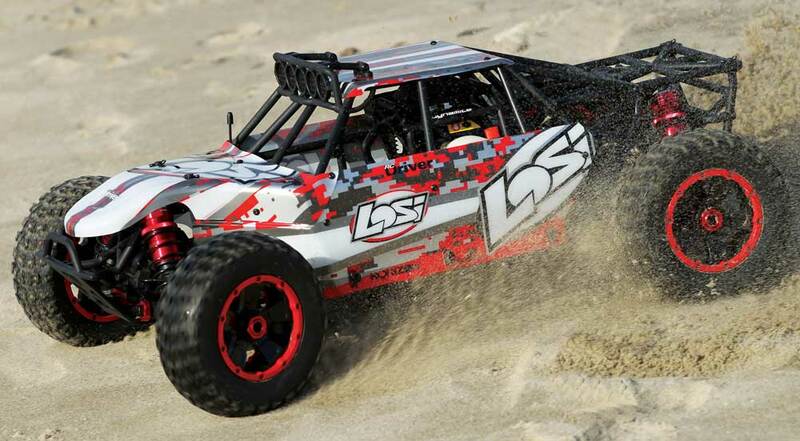 The Losi Desert Buggy XL is a lot of machine and pumps out plenty of excitement in the 1/5-scale realm. The fact that you can drop a grand and have a reliable machine to tear up just about any surface should get a lot more people interested in large scale. I can also see a lot of aftermarket manufacturers paying attention to this buggy and we should see lots of cool aftermarket support…I love projects! Everything but the gas and a charger is included with the DBXL. We really dig the wheel nut/ turnbuckle wrench multi-tool the kit comes with. If you look closely to the side of the engine, the center axle mates up with a stub axle before it connects to the center diff. This allows the engine to site close to the centerline of the chassis for better handling. • For starters, this is a brand new platform for Losi and doesn’t share anything with their 5IVE except for the decal logos. With that said, we’re excited to see another 1/5 option for large scale enthusiasts and Losi gets major props for putting efforts into this segment. Starting with the looks of the Desert Buggy XL, it has a robust cage with buggy-like panels screwed to it to give it that off-road buggy look. Unique body clips hold the cage to the chassis, but unfortunately the neat-looking light rack is just for looks and shows no sign of even being operational with aftermarket components. To support the nose of the body, there is a loop bolted to the front tower to keep it from flopping around. Once the cage mounts to the chassis posts and rear bumper posts as well as the tower posts, it becomes a very solid cage that protects the internals of the DBXL. A narrow front bumper protects the front end and a rear cage offers protection in the rear while adding unique style to the machine. • For the foundation of this big buggy, a 4mm aluminum plate was stamped countersunk and anodized with just a slot for the spur gear to clear. The sides of the chassis are press-bent to add rigidity and the engine mount holes are slotted to adjust gear mesh when changing gear sizes. Mud guards double as body mounts on each side and in the center, arched composite plastic braces front and rear prevent the chassis from bending in a crash. A long radio tray on the right side houses two large-scale servos, receiver and receiver battery. Getting to the receiver and battery is very easy with just three body clips securing the two lids. Other neat little features are a gear cover for any wandering fingers that may get near them, only three screws hold the fuel tank in for easy maintenance and the tank cap has a tab on top to make removal super easy. • The suspension arms front and rear are an H-arm design with captured hinge pins. We noticed they are pretty flexible as are the steering knuckles, but flex is better for those who are bashing their cars but they should still be fine for those who will take the DBXL to the track. The steering knuckles mount to the caster blocks in a king-pin style design with the knuckles pivoting on bushing and secured with a screw and nut. Bulky adjustable tie-rods and rod ends are found in the standard locations with just a few mounting points on the towers for adjustability. 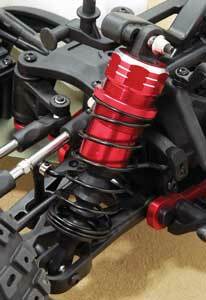 The shocks are massive with aluminum bodies that are threaded with preload collars to easily adjust ride height. The caps are a plastic insert with mounting pivot ball cinched by an aluminum cap. These are an emulsion-style shock and the shock shafts are a robust 6mm shaft with the piston bolted to the top. The shock towers have three mounting locations for the shocks and are thick, I mean super thick. Huge oil filled coil over shocks damp the suspension at all four corners. Shock boots prevent debris from damaging the shafts and o-ring seals. • Like many large scale machines, the DBXL has a dual bellcrank steering assembly with servo saver built into the right crank. An aluminum drag-link connects the two cranks and the hardware securing the linkages are really secured with ny-lock nuts. A nice feature we noticed is that the back of the top plate has steel bushing in it to prevent the plate from cracking under stress. We also noticed however, that the cranks are supported by bushings and not bearings…I smell an upgrade here. • On to the drivetrain. The diffs are very easy to access by removing a few screws, swinging up the bumpers and removing the capture plates that the secure the diff cases into the bulkheads. Once the case is out, remove the three capture screws to get to the diff…easy. The diff consists of a spiral cut main gear that mates up to a spiral cut bevel pinion that exits the case to the universals. The diff itself has a plastic cup with standard six-bevel gear set-up inside and viscously controlled with silicone oil. The center driveshafts are universal, however they uniquely route around the engine. From the center diff with massive steel spur, power is transferred to a stub axle beside the motor before a drive cup connects to the rear center axle. Dual disc brakes slow the buggy and can be adjusted separately front or rear; we’re fans of more rear braking. The front driveshafts on the DBXL are universal and the rear are dogbone and for those of you running in the sand, you’ll love the axle boots to protect the universal, cups and bone ends. • The powerplant bolted to the chassis is a Dynamite CY 23cc engine with a large can muffler for the exhaust and a dual stage filter on the intake side. When looking at the photos, you’ll see that there is a cage around the engine with cap over the plug as a second line of defense for those wild crashes that end up with the buggy on its lid. 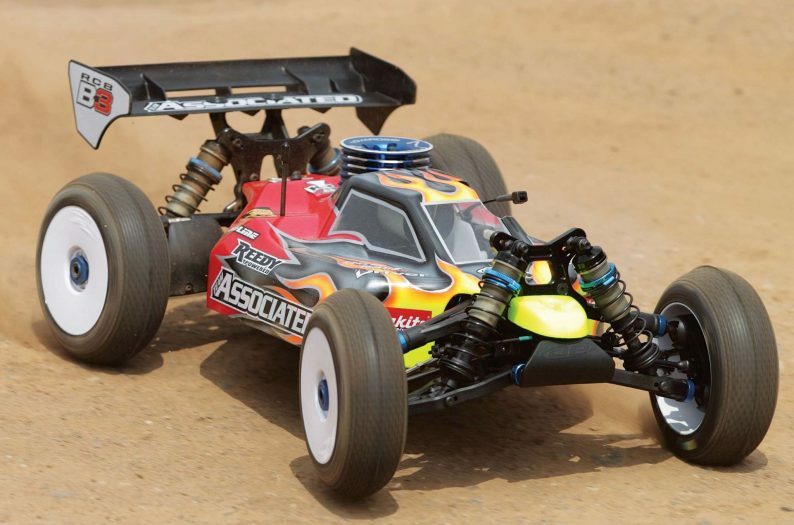 For electronics, the DBXL has two large-scale Spektrum servos to control the throttle and brake. 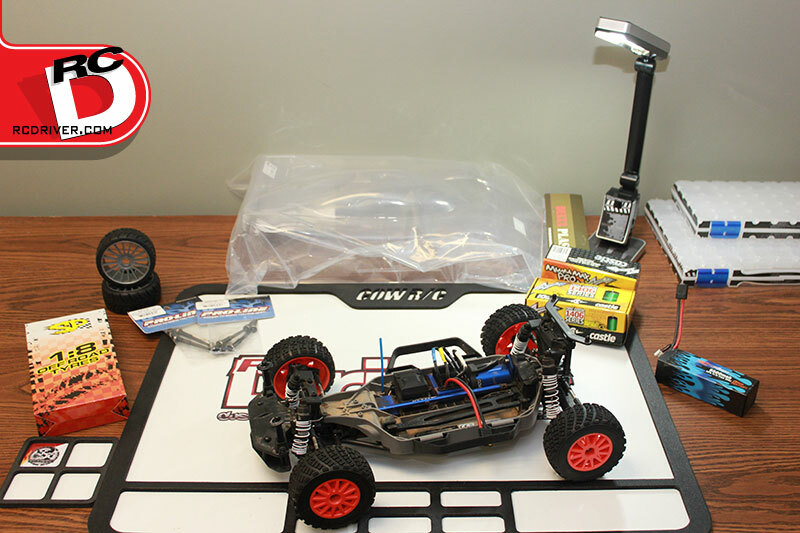 Losi supplies a 1700mAh battery pack to power the electronics; a pack over 2000mAh would have been nicer, but the 1700mAh should allow good run times for fun seekers. • At the time of print, hop-ups were not available for the DBXL. 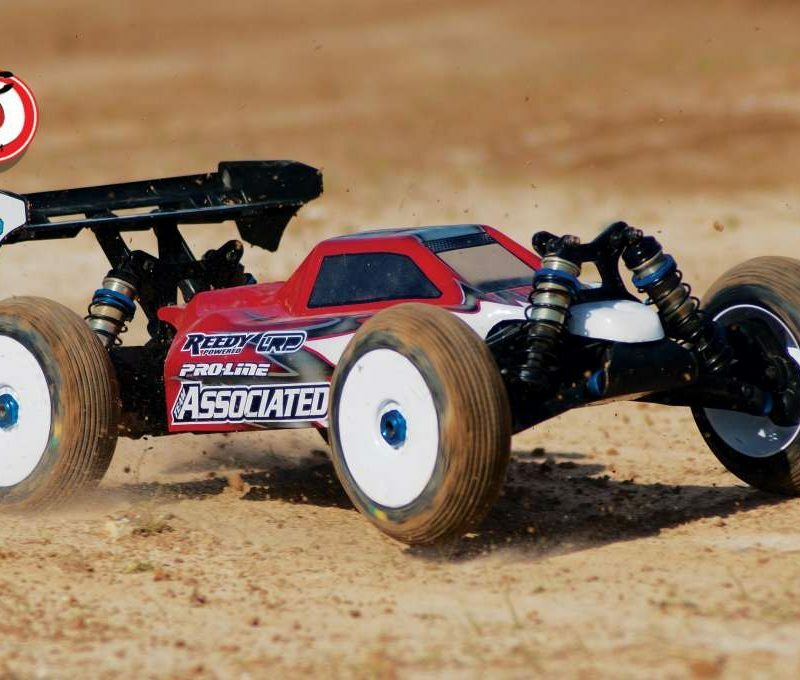 We’d like to see an aluminum front engine mount/clutch housing, a rear aluminum engine mount, aluminum steering knuckles and aluminum servo horn fashioned, and if produced, recommend that they would be your first hop-ups to bulk up the buggies’ durability. 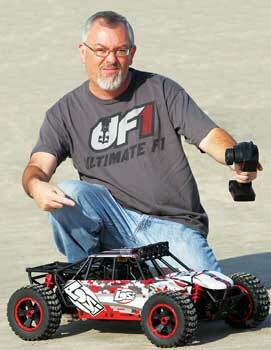 Lots of people are going to compare the DBXL with smaller, lighter RC Cars that are ultra-nimble. Remember that this buggy is near thirty pounds, so with that being said, the buggy turns fairly well for the amount of weight the steering assembly and servos have to deal with. Off power, it has a good turning radius compared to other large scale machines. On power, you will get some push on harder surfaces. On the sand however, you get a lot of dig in from the wheels which pulls the buggy around corners while throwing off a wave of sand. It’s pretty cool! The DBXL is equipped with a 23cc engine and a high stall clutch spring that helps the engine rev before engaging the drivetrain. Even with the set-up you’ll still notice some bog on the bottom end, so don’t plan on sending roosts of sand into the air from a hole shot. However up in the higher rpm range with some momentum underway, the buggy has some good power that will launch it off of jumps, carve cool turns on berms and make you take a few steps back as it speeds by. In the braking department, the DBXL has excellent braking ability with its padded plates and large vented discs. The buggy slowed up well after long straightway runs and after short bursts transitioning from corner to corner. What was really noticeable was zero brake hang-up, thanks to the springs releasing pressure on the plates as you let off the trigger. The one thing we’ll harp on is you need to use a hex wrench to adjust brake bias rather than with thumb nuts, which would be quicker and easier. 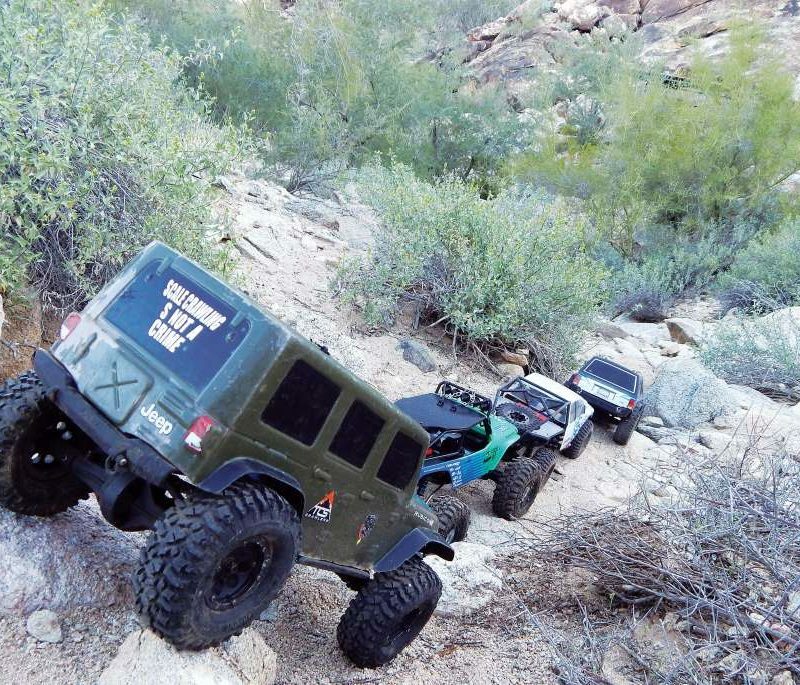 The big shocks and long arms soak up the bumps and jumps without getting the heavy vehicle load out of shape. While blasting through sand and dirt we watched the suspension compress and droop over some gnarly conditions. Lots of times, the buggy would just bust through clumps of dirt and sand, therefore providing that action and excitement drivers are expecting out of a 1/5 machine. Over longer runs, the suspension did deaden up a bit which would kick the rear end around, but nothing that got the DBXL to far out of control of our radio input. Like many large scale racers, the DBXL tends to drop the nose a bit off of bigger jumps so you want to make sure you manipulate the throttle a bit on the launch; let off quick and get back on the gas to bring the nose up. Then while you are in the air, keep your trigger buried so the momentum of the wheel helps keep the nose up or in the worst case, pulls the vehicle out of a dive on landings. In the sand, we had some spectacular crashes off some jumps while others were a cool, flat, level sailing experience. The DBXL has some killer moves. A lot of our testing took place in the sand, which is where you’d expect to see many vehicles called a Desert Buggy to be run. Sand is a lot more forgiving in the crash aspect, but can cause more wear as the sand actually blasts and grinds away at moving parts. The teeth on the spur and pinion were pretty shiny, but didn’t seem to have outrageous wear patterns. The boots kept sand out of the axles and we did suffer from sand fouling our pull-starter. But Losi offers pull start covers that should help minimize sand and other debris from getting into critical engine components. Left: The Dynamite 23cc engine bolts to the chassis in a similar fashion to 1/8 buggies and truggies. A cage over the top of the engine helps protect the spark plug. 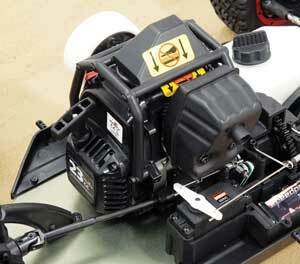 The throttle is actuated by a series of linkages and bellcrank connected to the servo and carb. Center: Bulky rear hubs support the axle bearings and stub shaft. The DBXL uses dogbones in the rear unlike the front which are CV-style shafts. Cool aluminum hinge pin plates have inserts to support the pins, however inserts to tune anti-squat and toe are not provided and need to be purchased separate. Right: Thick suspension arms feature droop screws and captured hinge pins. Here you can also see the upper boot which we pulled back so you can see the driveshaft end. 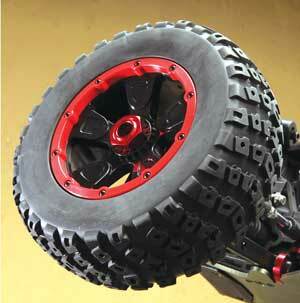 The gloss black rims with red beadlocks give this wheel and tire set-up a mean look. These tires are slightly taller than a 5IVE tire. Considering this is a completely ready to run 1/5 off-road machine that is four wheel drive and only requires you to pick up some gas and a charge on your way to have fun, we find it to be a steal for just shy of a grand. 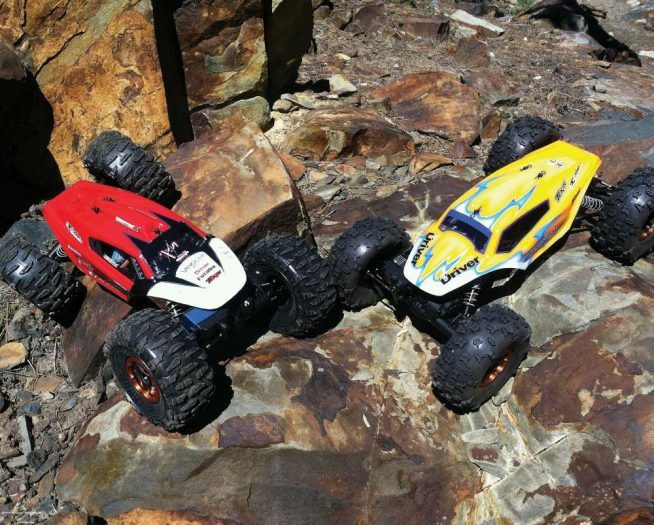 If you look at picking up a competitive 1/8 off-road machine, you’ll find yourself spending even more. 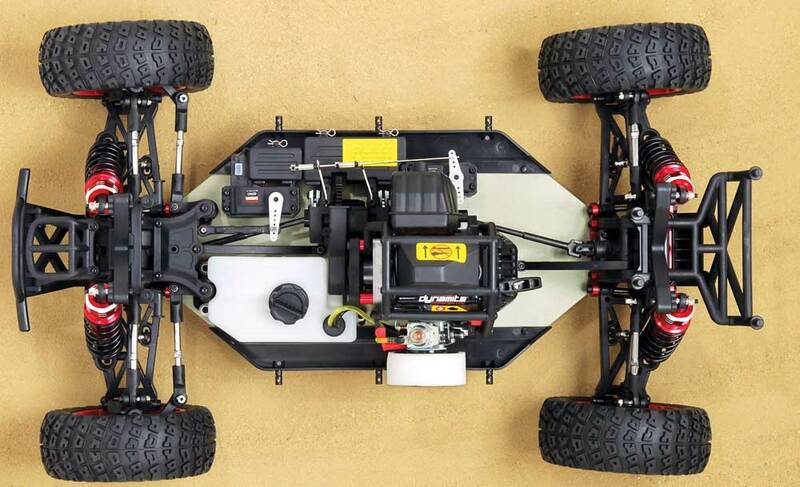 The engine may seem a little boggy for some already into 1/5-scale, which we see some complaining about, but hey, give Losi a break; they’re trying to create an experience for everyone that may be interested in this size machine. They did an awesome job of developing a buggy with style and the quality was there for our test sessions. Performance is right on par for the guy looking to go out bashing with friends and flat out having a good time. If 1/5 off-road has caught your eye but you were holding off for whatever reason, the Desert Buggy XL is what you need to pull the trigger on an all new off-road adventure. 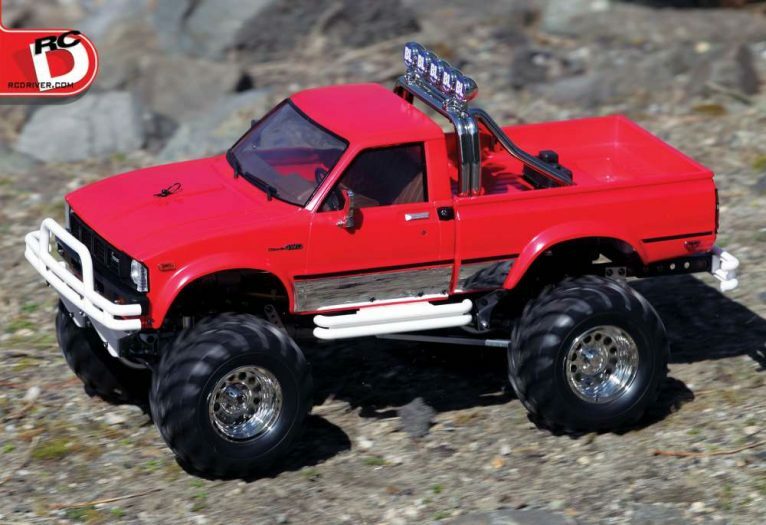 Buy RC Trucks for sale at the best prices today. Electric to nitro gas remote control trucks plus ride on trucks for kids with parental remote in stock now. Do you have some juicy news that we don't have yet on the RC Driver site? We want it! Click here and send us what you have!